Penultimate day! A few of the team decided to have lunch with me today at the pub opposite the office. They were promoting a Gourmet Hot Dog a couple of weeks ago but found none while perusing their menu. Being a Wetherspoons, every Thursday is Curry Club day. So settled for a curry instead. 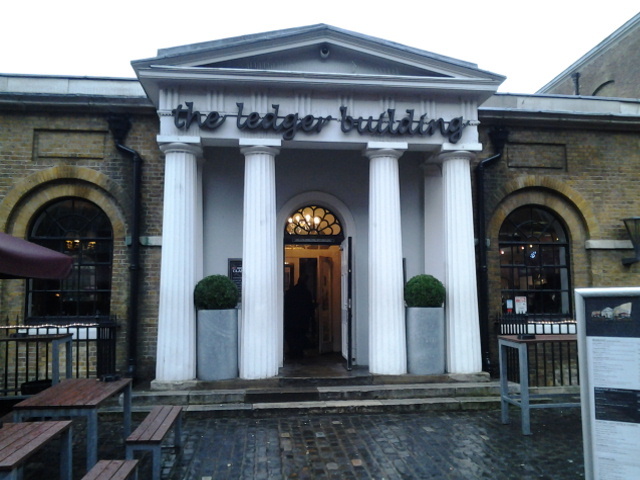 The Ledger Building is a pub from the J D Wetherspoons chain and is located towards the end of West India Quay. The building a bit unassuming on the outside but is huge inside. 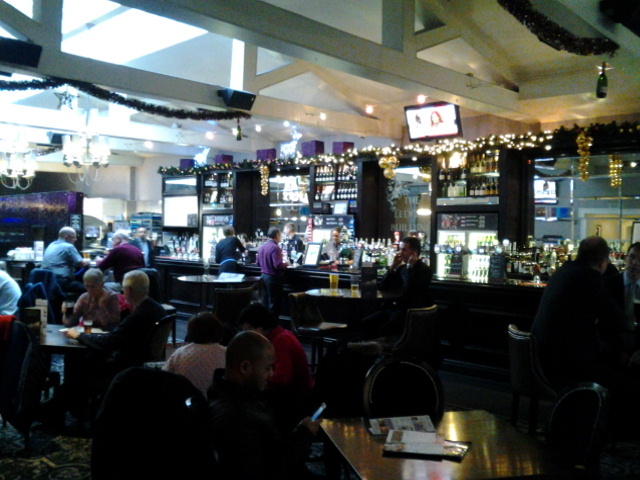 The pub is separated into the main bar area with a dinning area on the side and 2 other dinning rooms on the other side of the main corridor. The decor is rather classy with chandeliers and really high ceilings. If I’d known it was that nice, I would have visited earlier! 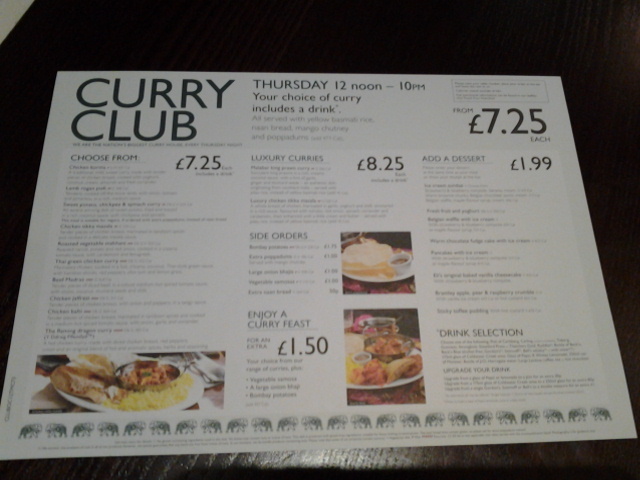 The number of curries available for Curry Club varies across the pubs in the Wetherspoon chain. The Ledger Building is one of those that have a more extensive option. 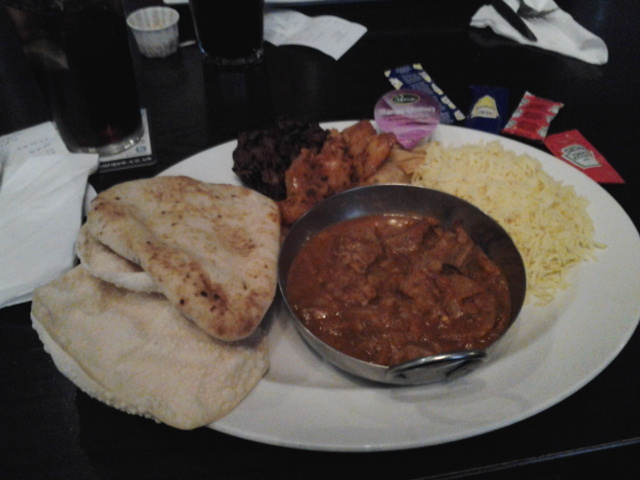 I settled for the Beef Madras as it’s supposedly more spicy than the rest. The main set comes with yellow rice, the curry, poppadoms, a naan bread and a drink with the option to make it a Curry Feast for £1.50 more. 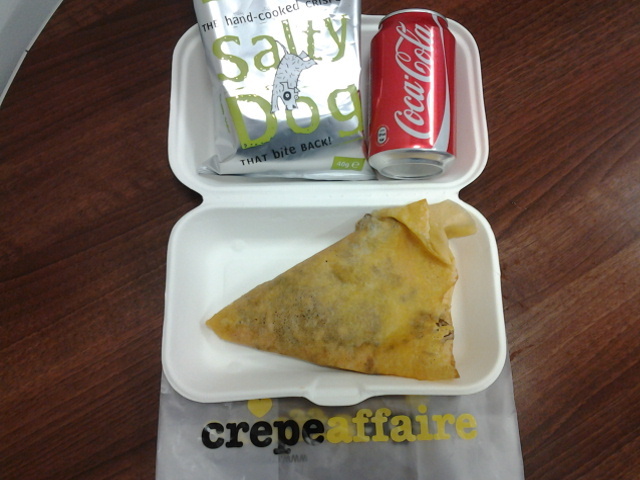 Yes, obviously I upsized which got me some Bombay Potatoes, a veg samosa and an onion bhaji. 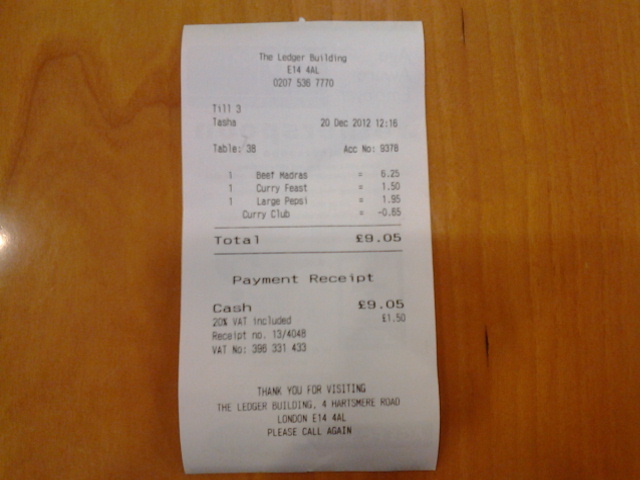 With the Curry Club costing £7.25 and the £1.50 for the extras, the bill should only be £8.75 but I was charged £9.05 instead. The bartender explained that I went for a pint of Pepsi thus the higher price. Duh! The curry arrived in no time and I proceeded to tuck in. The Beef Madras was not spicy at all and definitely needs more salt but the pieces of beef was nice and tender and the serving was ample. The rest of the meal was ok, nothing much to wow about. I highly recommend getting the Bombay Potatoes though, it’s the best rendition I’ve had so far with loads of softly saute onions in a tangy tomato based sauce. Good stuff! P/s: There is a Gourmet Hot Dog after all! It’s not in the menu but there are posters around the pub. Too bad I ordered before I spotted the posters. 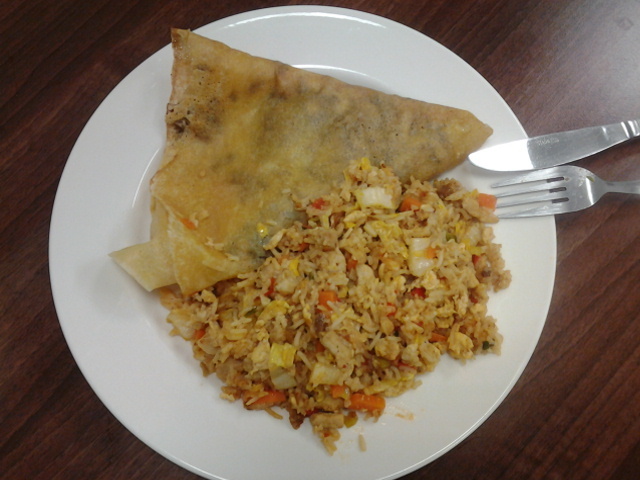 Managed to find some free time today so decided to have an eat-in lunch rather than takeaway. 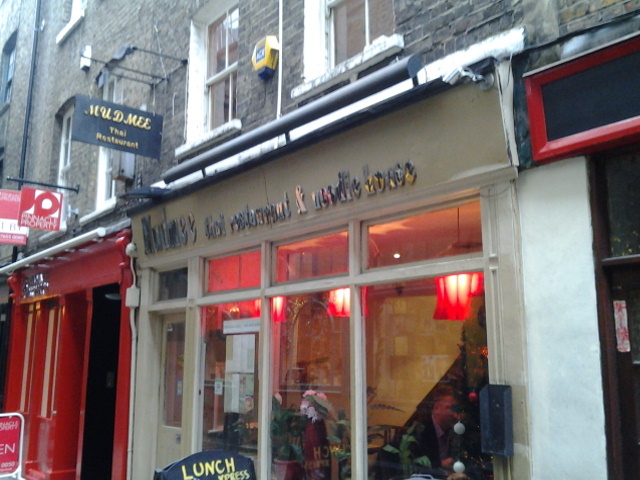 Passed by this small Thai restaurant Mudmee if I snake my way from Liverpool Street Station to Brick Lane via the small passageways and decided to give it a try. As I was pretty early, managed to get seated as soon as I walked in. Dare not take too much photos of the restaurant and food as I was given a couple of dirty looks by one of the waiters while I was taking pictures of the restaurant’s facade. 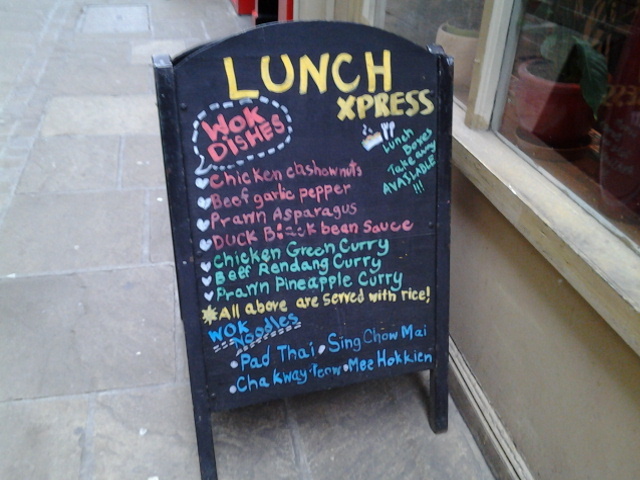 Looks like apart from the regular menu, they also have an Express Takeaway lunch menu. Unfortunately, nothing on the Express Takeaway lunch menu took my fancy so I went with my numero uno comfort food, Singapore Laksa! Sacrilegious to order Singaporean food in a Thai restaurant but I need some TLC today. 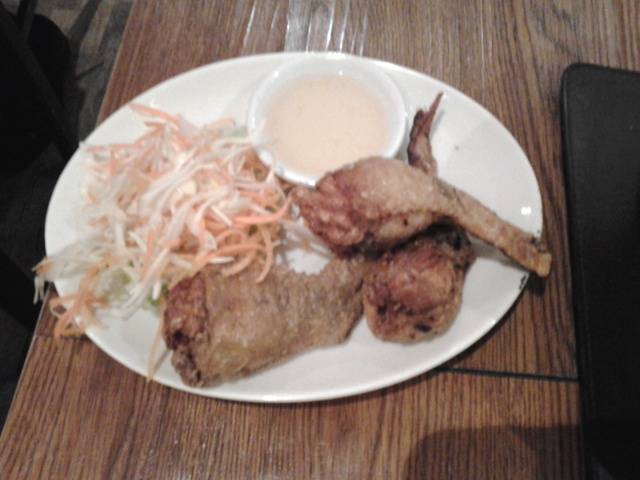 To make it a 2 course lunch, I also ordered Peek Gad Yud Sai which is deep fried stuffed boneless chicken wings. The laksa was £7.90 while the chook wings was £4.90 which takes the total to £12.80. Not exactly cheap, let’s see whether it can live up to my fav from Keke’s. Both my orders came within 5 minutes and I’m glad the laksa looked the part. Gave it a stir and was pleasantly surprised that they used both rice vermicelli as well as thick egg noodles. 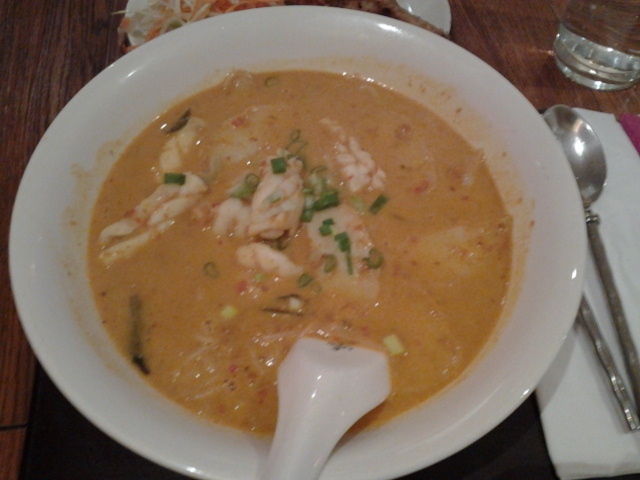 There was generous slices of fish cake, squid and prawns all in a coconut milk and spiced based soup. Taste wise, pretty good, 2 thumbs up! Well, it’s not exactly Singapore Laksa, more like a Thai rendition with strong hints of lemon grass and slightly on the sweet side like a Thai Red Curry. There was quite a few curry leaves scattered throughout I guess to replace laksa leaves and my only complain would be it’s missing some crunch, some bean sprouts would be nice. What about the stuffed chicken wings? 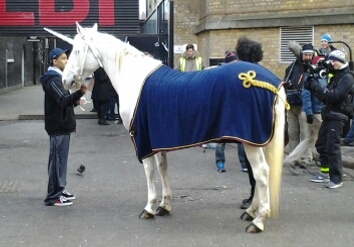 Looks wise, it fits the bill but was sorely lacking taste wise. Both the wings and stuffing lacked seasoning and requires furious dunking in the plum sauce provided. They have also been over fried, though crispy is tough and dry. Really disappointed. If you intend to lunch here, be early. 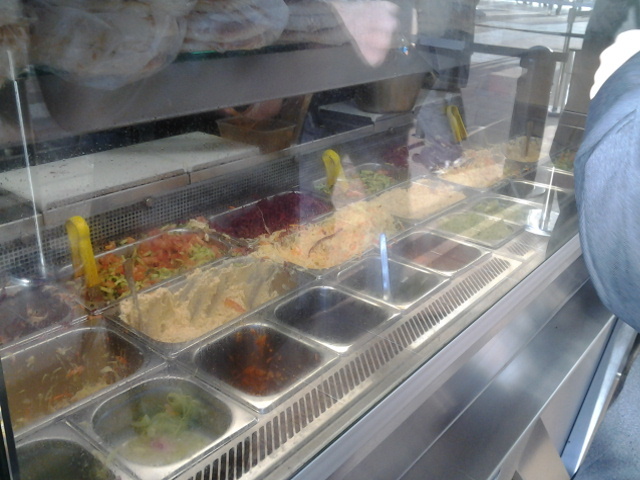 It was jammed packed with queues snaking out the door by the time I’m halfway through my lunch. Some takeaway food have a tendency to be visually unappealing. I think the options that are smothered in gravy fair the worse. 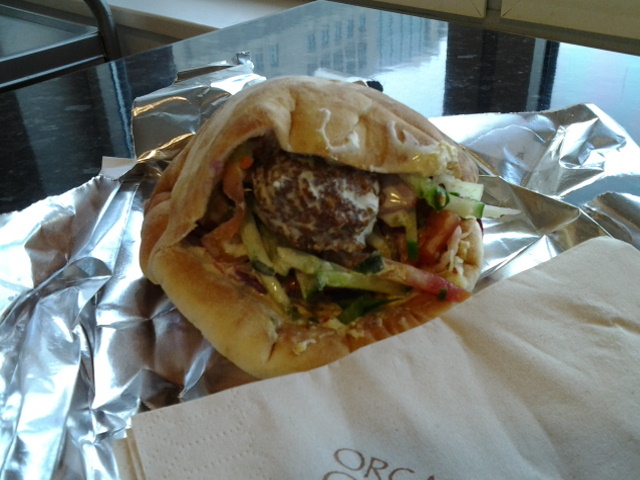 Today’s lunch is case in point. 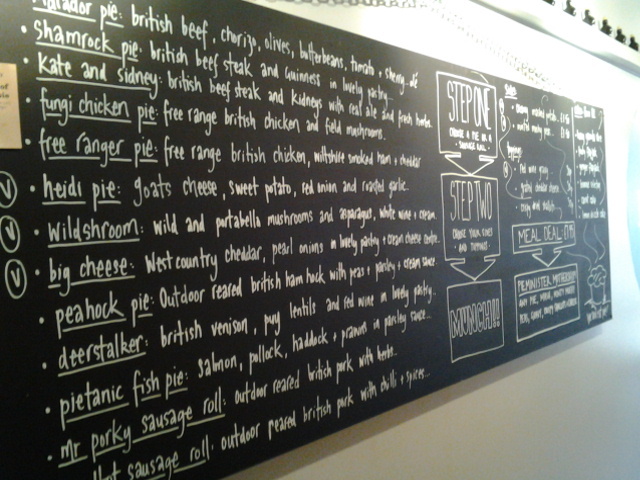 Have been wanting to give Pieminister at the Boxpark a try for sometime now. 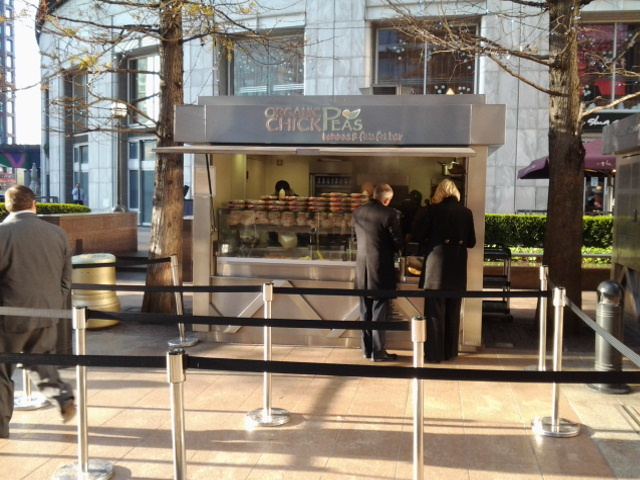 Never got around to it as the weather was not conducive for rich stodgy food till recently. 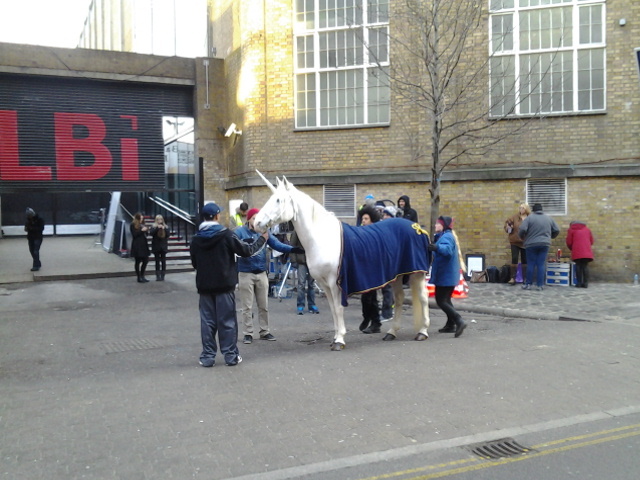 I think this is the final food stall at the Boxpark I have yet to review. 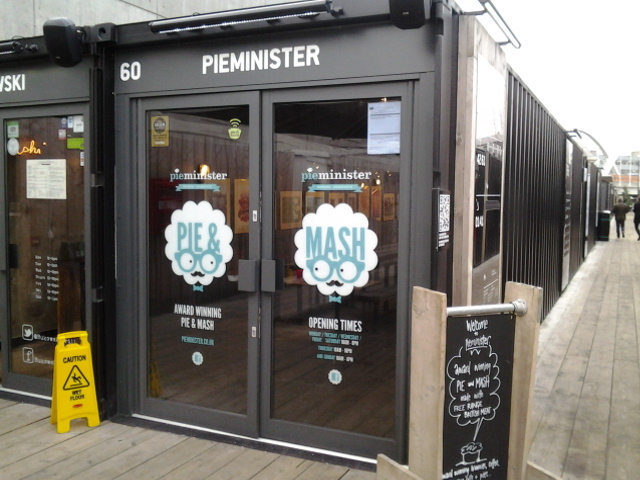 As usual, Pieminister like the rest of the other shops in Boxpark is in a shipping container. Booth seats are available inside the shop as well as some outside seating. 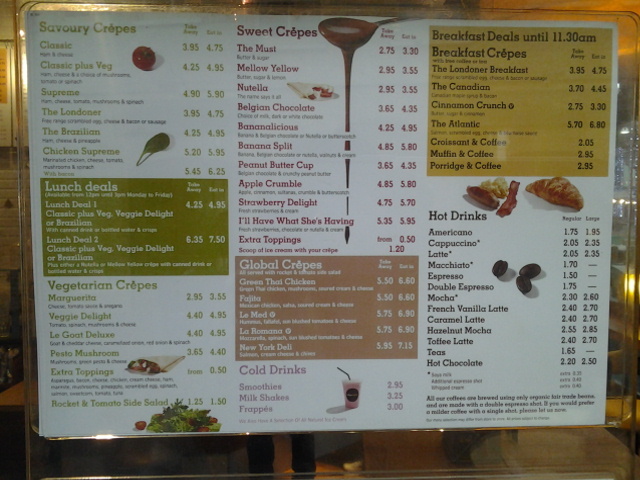 There are many pie options all at £4.20 each. Do ask what is available from the range as though they are not made in stall, they are baked on location. 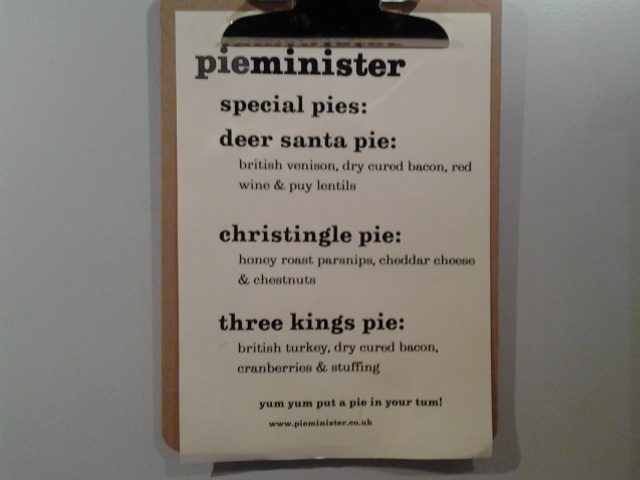 I like that the names of the pies are a word play on the pie’s ingredients. Kate and Sidney = Steak and Kidney, Chicken of Arragon = Chicken and Tarragon. I got one of the festive specials, the Deer Santa. Guess what is the protein in the pie? Yeap! Deer Santa has venison in it. Deer = Dear you see? Funny eh….heheheh… ok, I’m easily tickled. Was toying between mushy peas or mash with my pie and since I brought some leftover cauliflower cheese I made last night, went with the pea option. 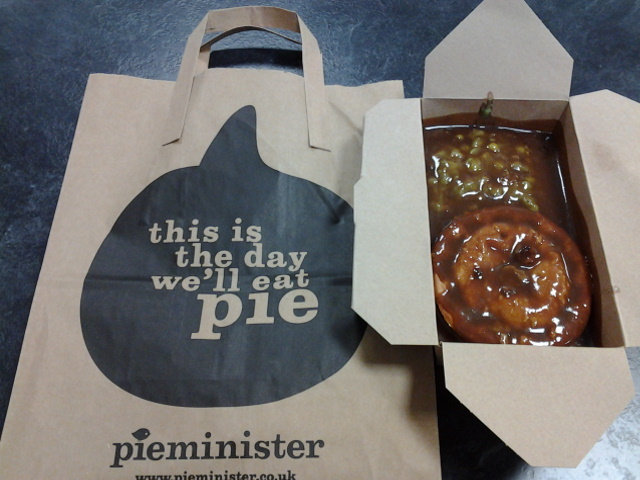 Total bill came up to £6 with the pie at £4.20, mushy pea at £1.50 and gravy at 30p. Now you understand why I say this is not exactly pretty. The gravy obscured everything and made everything brown. Even the bright green of the minted mushy pea got drowned out. 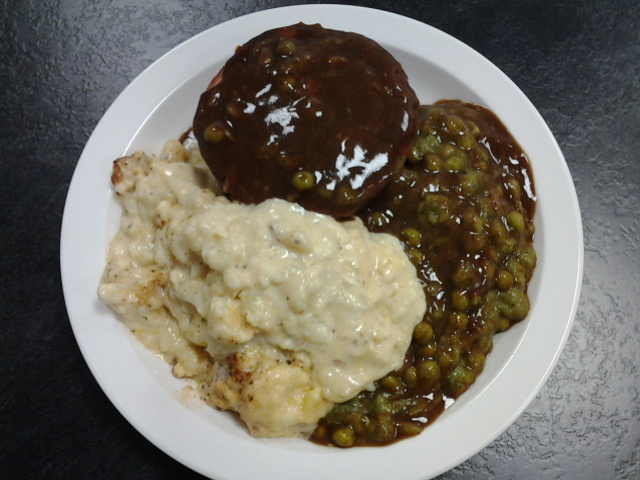 Regretted having the gravy really, it did not mix very well with the nutty and tang of the mush peas which is a tad too minty for my taste. It also very nearly masked over the rich ale sauce of the pie. The venison chunks taste pretty good though, rich and beefy. If I didn’t know it was venison, I would have thought it’s a beef pie! Highlight of lunch today was my leftover cauliflower cheese! Not going to blow my own horn too much but halving the cheddar and substituting it with cottage cheese actually worked pretty good. It’s raining cats and dogs today in Londonium so forgive me for not venturing far on my lunch forage. 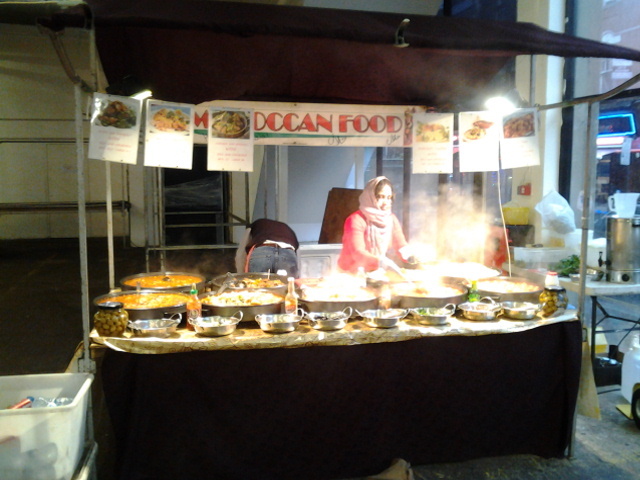 There were still quite a few food stalls at the F block area at Old Truman Brewery which I have yet to try and it is literally round the corner from me. 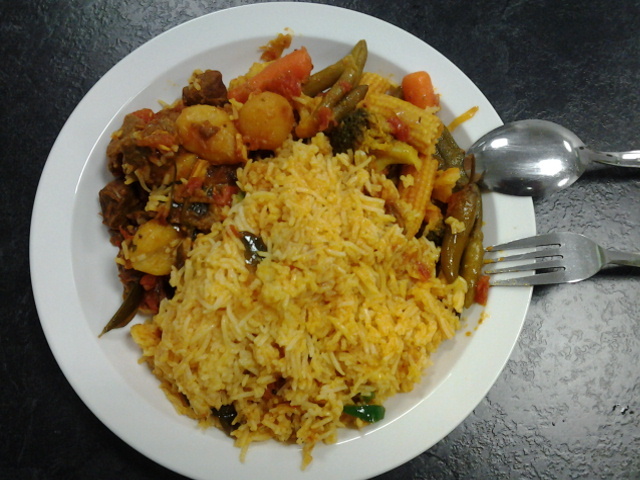 Today, there was a Sri Lankan, a Mexican, a Singaporean, a Chinese, the Tibet Kitchen which I tried, a Morrocan and a bread stall. The Morrocan stall was just next to the entrance and the lady running it offered me a taste of the lamb kofta which was pretty yummy so thought why not? Of the many tagines available, I remember there was a chicken, lamb, spinach and chickpea, mixed veg, meatball and lamb kofta. All can be served with either rice or couscous. Regular serving for £5 and go large for £6. I went with the large lamb tagine with rice and as I was busy taking pictures, the nice lady prompted me to select another dish. Why didn’t I thought about that? I picked the mix veg as I had lamb meatballs just a couple of days ago for dinner and was hoping it will be the healthier option. There is a range of condiments like pickled chilies, jalapeno, coriander, pickled silver skin onions, fresh tomatoes which you can add to your box. The box I got was already full to the brim so I just got a couple of pickled chilies. 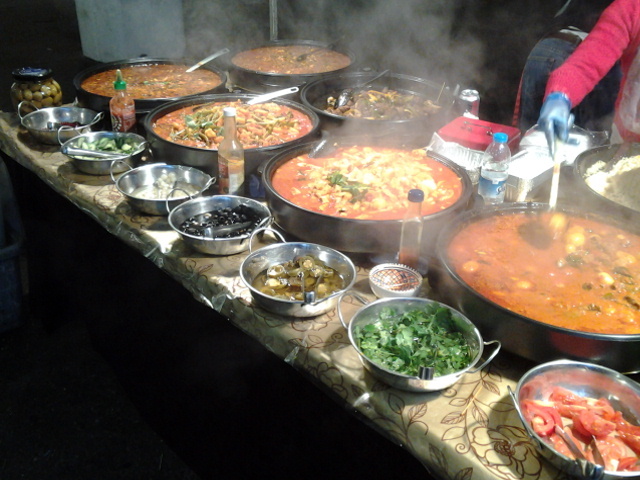 Though it might look spicy, Morrocan food is usually rather mild from my point of view and this is no exception. The lamb pieces were tender and the profusion of curry leaves was a nice touch. 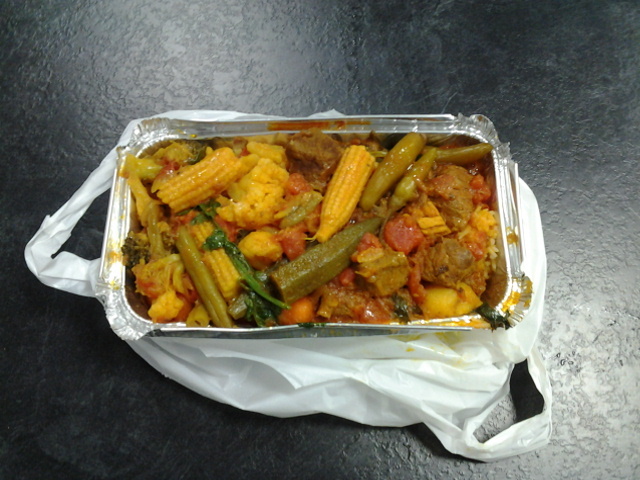 I actually preferred the mix veg tagine to the lamb perhaps because I have an okra addiction, just simply love the slimy texture and the way it soaks up the flavour of whatever sauce it is cooked in. The other veg were also pretty cook if not a tad over done. 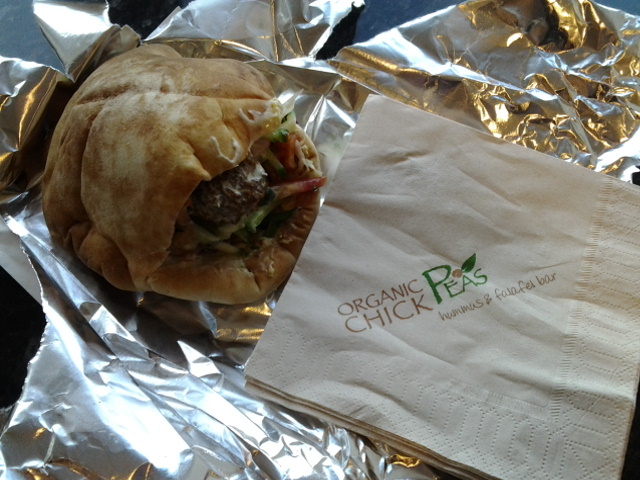 In all, good feed for £6 but not exactly titillating taste wise. Seeing that my tenure in the East End is coming to an end, I can either concentrate on eating the things I love here or I can blog about places I have yet to try. I’m going with something new today. 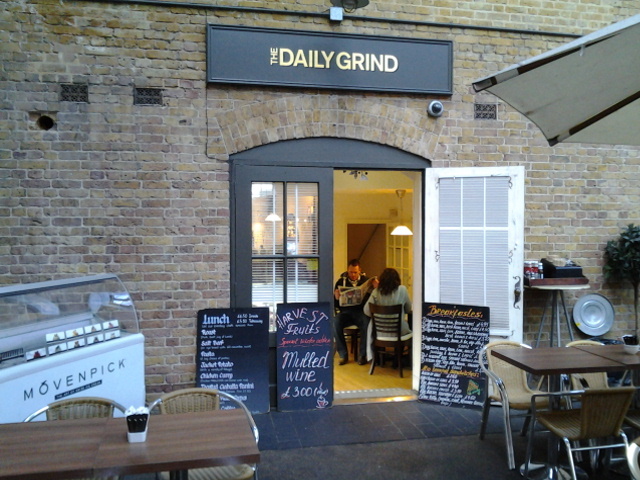 The Daily Grind is a small little cafe tucked in the corner of the Old Spitalfields Market. 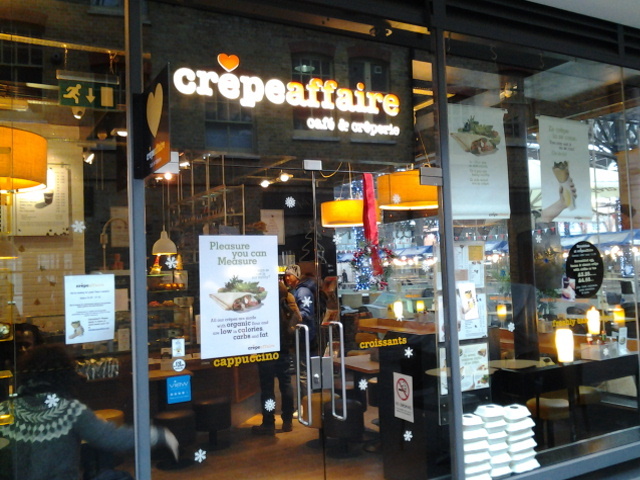 I walk by it frequently and looking at the menu, it’s a typical cafe serving toasted sandwiches, a selection of pastas, baked potatoes with choice of filling and some pastries. 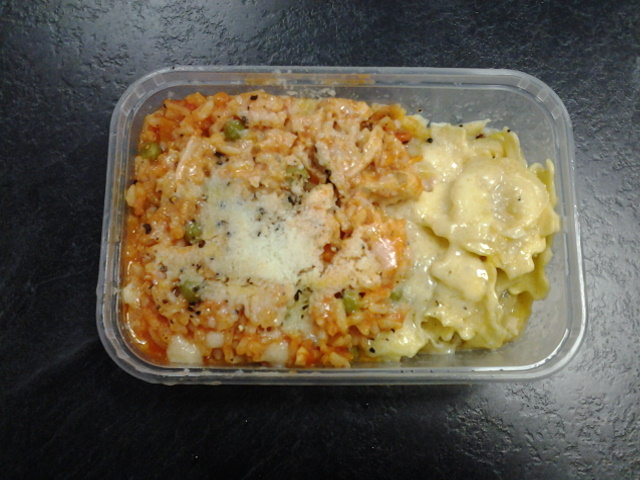 I went with a mix of 2 pastas as I did not feel like have a sambo. 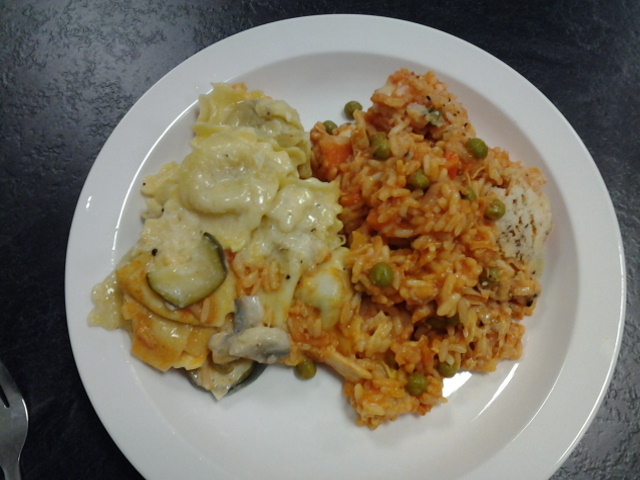 Got the server to make up a mix of Wild Mushroom Ravioli and the Chicken Risotto. At £5.50, not as good value as Mangiare but we shall see how it taste. Did not have high hopes as most pastas at cafes are a thrown together affair, purely to fill the tum. Was pleasantly surprised though. The risotto was tangy but velvety smooth on the palate with each rice grain still intact and had plenty of shredded chicken scattered throughout. Most raviolis I have tried are either overcooked or with areas of the pasta underdone. This one was cooked perfectly with still a slight chew. If only the mushroom filling has a stronger woody taste and more courgette in the sauce, this would have been perfect. 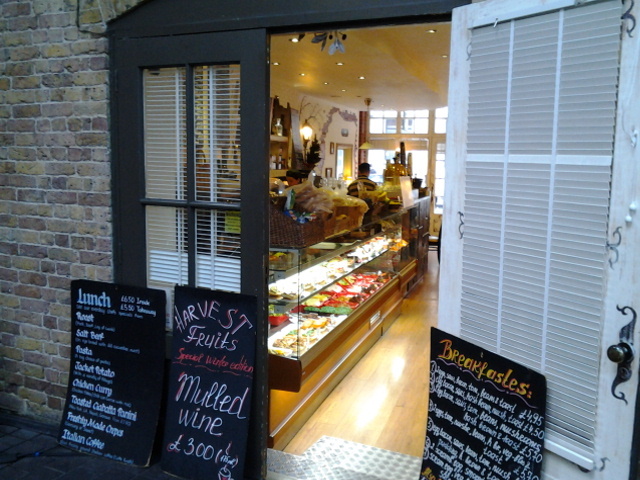 So, I’m pretty glad I gave this small cafe a go. Hopefully I’ll have a chance to make a repeat visit but I highly doubt that.